By coincidence or pre-arrangement, both Apple Daily (Part 1 and Part 2) and Ming Pao (Part 1 and Part 2) decided today to feature the infamous white house of west Hong Kong in multiple parts. It is likely that the majority of people in Hong Kong have never heard about this place. The reason for the reports on this day is that TVB has rented the house do some filming. The press caught wind and then this piece of Hong Kong history was brought back into light again. Where is it? You can pick up a detailed map of Hong Kong and you go to the intersection of Victoria Road and Mount Davis Road. This is where the house is. You can look for any indications on the map. There is none. In fact, the Hong Kong government has never assigned a street number to the two buildings. So you can get out there yourself and this is what you should look for (see photograph below). The white house was officially known as the Mount Davis Concentration Camp and was used during the 1967 riots to incarcerate political prisoners. 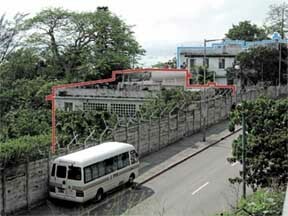 It is located on Victoria Road in Kennedy Town and sits on a slope facing the sea. From the living room, there is a magnificent ocean view. The white house is hidden among verdant trees. The walls have barbed wires on top and there is a close-circuit television on the outside. This house which caused fear among dissidents looks quite ordinary and uninteresting. A passersby might just think that this was a private villa. The white house used to be a recreational club for British soldiers. In the 1960's, it was requisitioned by the Special Branch for the purpose of detaining and interrogating political prisoners. During the period of the 1967 riots, at least 52 leftists were detained here, including the actors Fu Qi and She Wei and the Chinese Reform Association secretary Choi Wei-hung. It was rumored that after the June 4th 1989 incident, the white house also received democratic movement activists who had been smuggled over secretly and then given political debriefings here. How was life inside the white house? Here is the Ming Pao story from Chinese Reform Association secretary Choi Wei-hung (蔡渭衡). "It was such a small and enclosed place and they turned on the ventilator and shone a strong light on me. It was hard to either sit or sleep! The sound of the ventilator continued all day at deafening volume. The light in the face was unavoidable. I could not tell whether it was night or day, early morning or late night." During the period of the 1967 riots, Chinese Reform Association honorary president Choi Wei-hung was detained at the Mount Davis Concentration Camp for a year and a half. Five years ago, he wrote about his experience in Ming Pao and told us about the horror for the political prisoners imprisoned in the white house. During the period of riots, Choi Wei-hung was the secretary of the Chinese Reform Association. Without being interrogated, charged or judged, a black hood was placed on his head and he was shipped to the white house for detention. The horror of the white house was not about physical torture but the mental abuse. The camp mates called their single-person cells "tin cans". On the floor, there was one wood board that served as the bed. There was a powerful ventilator in the corner. Overhead, there was a strong light. Choi Wei-hung was number 452 back then. In his essay, he wrote about how he was brought to the white house. After the black hood was put on this head, he was led through the hallways. "There were the sounds of chains moving. Then a lock was opened. The camp guard next to me whispered into my ears: "Be careful! There are stairs." I was then sent into a 6 feet by 4 feet prison cell. On the grey-white wall, someone had written "For the country" and "Better dead than surrender." 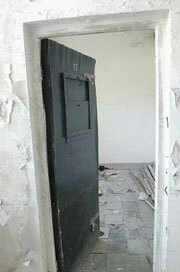 Choi Wei-hung said that the mistreatment included solitary confinement for several months. The prisoners were completely isolated from the outside. There were spy holes on all three walls. Since the restroom was outside, they had to bang on the door loudly to be let out. But if nobody came, they would have to do it inside the cell. As for food, they had three means of "sandy rice" (沙谷米) served in a plastic bowl -- rice that was mixed with sand with some tiny stinky salted fish -- plus one half cup of tea. The white house was the secret prison used to imprison political prisoners and terrorists during the British colonial period. It also served as the training school for Hong Kong/British secret agents. Many famous people with ties to the Chinese Communist Party were prisoners here, including the famous 1960's actors Fu Qi and She Wei, the spy police inspector Tsang Chiu-Fo, etc. Since the prisoners had important key information that the government needd, the special agents at the white house would use any means including drugs and hypnosis to induce the prisoners to confess. After a political criminal was arrested, he/she would be sent directly to the white house for secret detention. From the moment that the criminal was arrested, a black hood was placed on the head until he/she was sent into a windowless prison cell. Thus, he/she would have no idea where he/she was and no idea how much time had passed. Inside the cell, the prisoner can only wear underwear. Combing and washing were not allowed. Each meal was plain food without any meat or hot soup or water. During the day, most of the time was spent with non-stop interrogation by the special agents. Although the special agents tried to adhere to non-violent principles, they would imitate MI6 and used drugs and hypnosis to make the prisoner confess. Under conditions of extreme fatigue and confusion, the prisoner often spilled out everything. The political prisoners held at the white house did not have limits on their period of detention. The Special Branch only had to apply to the Governor and then they could detain the prisoner indefinitely. By the way, you can also rent this house from the Hong Kong government today for filming purposes. Even the movie "2046" was shot here. Here is a question: Wouldn't you think that this is a prime Hong Kong historical heritage site? If not, then why not? Alternately, why would the knights and dames of the British empire such as Donald Tsang and Anson Chan not want to hear about this place? (SCMP) Call to save 'zoo' where rioters were caged. Donald Asprey. May 14, 2006. The chairwoman of the Conservancy Association has called for the preservation of the Victoria Road Centre in Pokfulam, a former detention centre referred to as "the zoo" by the political prisoners it housed during the 1967 riots. The former mess of the Royal Engineers Regiment was built in the early 1950s and last used to house dissidents fleeing the mainland in the wake of the crackdown in Tiananmen Square in 1989. The buildings are in a state of disrepair. "Although the houses themselves have no defining characteristics, because of the famous prisoners that were held in it," said Betty Ho Siu-fong. "Like it or not it is a part of our heritage and it should be preserved." Bereft of nameplates or signposts and unmarked on road maps, the two ordinary-looking concrete mansions - with spectacular views of Green Island - are at the junction of Victoria Road and Mount Davis Road, hidden behind dense greenery and protected by double rows of barbed wire. The centre was renovated in the late 1950s, at the height of tensions across the Taiwan Strait, to hold Taiwanese spies caught smuggling explosives to the mainland before they were shipped back home. During the 1967 disturbances, it held 52 "instigators" under emergency regulations designed to crush morale among leftists and drive ringleaders of the movement underground. Among those held were famous actors Fu Qi and She Wei, and Chinese Reform Association secretary Choi Wei-hung. The last known residents were political refugees fleeing the mainland after the 1989 Tiananmen crackdown. They were debriefed at the site before being deported. There were rumours before the handover that the centre was used to detain Taiwanese spies to ensure the mainland did not accuse Hong Kong of being a base for subversion. But while fielding questions from the Legislative Council, former secretary for security Alistair Asprey said in 1994 that the centre was only used for training purposes and was undergoing renovations. It is thought that detentions of foreign agents continued until the handover, although the police unit responsible for monitoring Taiwanese agents was largely disbanded by 1995. Special Branch was replaced by the Security Wing, which is not thought to be actively operating against agents from Taiwan. It is not known whether agents may have been held in other locations. After the handover the centre was rented out to TVB for use as a film set and also for Wong Kar-wai's film 2046. A government spokeswoman said the Antiquities Advisory Board decided what constituted a historical heritage site and what should be preserved. She added that the buildings were managed by the Government Property Agency and were not currently under any threat. (SCMP) 'We prisoners called it the Mount Davis Concentration Camp' Donald Asprey. May 14, 2006. It was July 1967, in the midst of an unusually fiery summer. What would later be known as the 1967 disturbances had been raging for two months, and confrontations between crowds and the police had escalated to violent clashes. Strikes on public transport and utilities had begun to take their toll, bringing the workforce to a grinding halt. Violent exchanges occurred on a daily basis, and on July 8, hundreds of militia from across the border fired at police in Shataukok, killing six. Amid an increasing sense of panic, then colonial secretary Michael Gass told the Legislative Council on July 12 that the government was determined to grab the initiative. Daily police raids were launched against suspected communist strongholds, including what the government claimed were probably the first raids using helicopters on multi-storey buildings. Police seized weapons, explosives, posters and leaflets, and according to government accounts at the time: "Communist leaders were driven underground and were no longer able to co-ordinate and direct the activities of their supporters." It was against this backdrop that Choi Wei-hung waded into the plot, in his capacity as secretary for the Chinese Reform Association. On July 18, 10 days before emergency regulations were signed into law allowing for suspected instigators to be detained without charge, British Special Branch officers came banging on his front door in To Kwa Wan. Mr Choi was taken blindfolded to an isolated corner of Pokfulam, the location of a secret detention centre referred to by police as "the zoo". There, he was stripped to his underwear, given the number 452 and thrown into a cell just 1.8 metres long and 1.2 metres wide. A blinding light shone overhead 24 hours a day and a noisy fan provided ventilation. "It was such a tiny place, it was obvious it was not meant to be a jail. There was hardly room to stretch, a plank of wood on the floor for a bed and a coarse, stinging blanket," Mr Choi recalled. "When I wanted to go to the toilet, I had to bang on the door, which the guards would choose to answer if it pleased them. "There were peepholes on three of the walls to let them look in, but I couldn't look out. With the light shining, I couldn't tell if it was day or night, let alone get any sleep. "The food was barely enough to stave off hunger, with sand mixed into the rice and rotten fish. I was told not to speak to anyone or they would turn the lights and the fan off and I would suffocate. "Every seven days, they would take me out and show a warrant, signed by an official, confirming my imprisonment for the next week. "They told me I could leave by either of two ways: I could either go straight out, which meant I would leave Hong Kong, or I would go out in spirit after I died. My family didn't have a clue where I was." He said one of the things that sustained him was hearing the enchanting voice of fellow prisoner She Wei, a famous actress who, during her imprisonment, sang encouragement to new arrivals every time she heard the clang of the locks. Mr Choi was kept in solitary confinement for the first six months of his incarceration, during which time he nearly lost his ability to communicate. As the riots fizzled out towards the end of 1967, he was transferred to a bigger cell, which he shared with one other detainee, and received visits from his wife. He was released in January 1969, after 18 months - six months longer than stipulated by law. Mr Choi denied he had anything to do with fomenting violence or ever posed any danger to the Hong Kong government. "Back then, it was dangerous even to wave the Chinese flag or to sing the national anthem. They [the British] were so scared of China, they didn't want anyone having any contacts across the border. "The British government is not what you think it is. They did terrible things then," he said. Despite reliving his worst memories, Mr Choi is in favour of preserving the barricaded compound. "We prisoners called it the Mount Davis Concentration Camp. You would never imagine such a place existed here in Hong Kong. It has certainly got history. I would like to see it preserved."